What is the first piece of music that you remember hearing and what was the first time that music made a deep impression on you? Why is it that secular or popular songs can deeply affect people as much as religious music from different traditions? Having learned to sing in various choirs and play musical instruments from a young age, I have had a lifelong practical interest in music of all kinds, including folk, soul, jazz and western classical. I was particularly affected by the experience of singing in a number of English cathedrals, our school choir taking the place of the resident cathedral choir every Easter holiday. There was a sense of another possibility in music – of its ability to help us to awaken to a deeper or higher level. Does our response to music and indeed any sound not depend to a large extent on our own inner state at any given moment and our ability to listen? What is the difference between “hearing” and listening”? There is a wonderful line from The Mysticism of Sound and Music by Sufi Inayat Khan in which he describes the purpose of the introductory phase (alap) of an Indian raga performance by a master musician, “First the musician tunes his instrument, then himself, then the audience”. What can help this inner tuning? 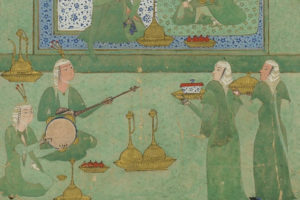 In Middle Eastern and Indian music, the scales used involve much finer intervals than the 12 note tempered scale in western music which was developed to enable harmonies between different instruments. Traditional music from these regions is usually based on a single melody accompanied by a drone note. The lead musician’s skill in using these finer intervals in the melody determines the effect on the audience. It is quite extraordinary to discover that the auditory system of the human body is highly sensitive to intervals between notes in the scale which are in numerically simple ratios to each other, for example the three most harmonious intervals in relation to the starting note “Do” of an octave are the octave higher (double the frequency of the first note), the fifth (3/2 times the frequency of the first note) and the fourth (4/3 times the frequency of the first note). The western tempered scale is only an approximation of these precise intervals, which is why if you listen to a piece of western orchestral music after listening for example to traditional Indian ragas for an hour or so, the music sounds gratingly out of tune. Georges Ivanovitch Gurdjieff was born in the Caucasus at a time when ancient religious, musical and storytelling traditions in this region were still very much alive but increasingly confronted by Western rationalistic thought in which scientists viewed the world as a series of phenomena distinctly separate from their own living experience. He embarked on a long search into different religions and their accompanying musical traditions across many countries for answers to burning questions – why does humankind suffer, what is the role of a human being in the universe, and how can humankind develop? As a result of this search he developed a practical means for an individual to develop his or her level of consciousness that can be applied to the modern circumstances of life, based on a deep knowledge of ancient traditions. This method demands a rigorous, even scientific demand to verify the truth of the ideas for oneself. 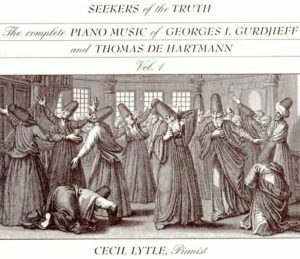 A central part of this orally transmitted teaching is the music which Gurdjieff composed with Thomas de Hartmann – an extraordinary collections of over two hundred pieces for the piano. They range from simple folk songs to ceremonial temple dances and religious music which can convey an entirely different world of increased inner awareness, and speak of greater inner harmony between the body, intellect and feeling. There is a particular use of certain modes and higher harmonics which emphasises the inner resonance of the sounds, even using a tempered instrument such as the piano. The In Between web site contains several articles on music and concert reviews which may be of interest to anyone interested in different musical traditions and deepening questions on the effect of finer music intervals on the human psyche. The following are also recommended. 1. The Indian Raga Guide by Nimbus records – a beautifully illustrated book and accompanying recordings of 74 Indian ragas, including the only raga which is allowed to be played at any time of day or night (Bhairavi) in traditional Indian music concerts. Ragas use much finer intervals in their scales than the western tempered scale intervals, since there is much more reliance on a single melodic instrument accompanied by a drone note than in western polyphonic music. 2. An Introduction to the Study of Musical Scales, by Alain Danielou. Out of print but second hand copies can be purchased. This describes the Indian system of ragas, and the Chinese pentatonic scale in detail. 3. The Hundred Thousand Fools of God by Theodore Levine. This is a lively description of the author’s search for the last vestiges of ancient musical traditions in countries such as Uzbekhistan, accompanied by field recordings of a number of master musicians. 6. This is the web site for Akn, a Paris based organisation which is actively re-discovering and developing the Armenian traditional liturgical chant. 7. 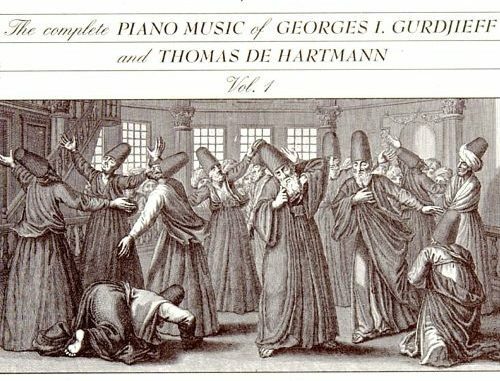 Information on the Georgian polyphonic singing tradition can be found at this web site, including details of the group Sathanao (which in Georgian means “something very precious and valuable to your heart”).